WELCOME TO THE CASTLE KITCHEN!!! Time to get cookin’ with bacon! For years now The Royal Mom has seen recipes for “bacon jam” and thought “ICK” – you’ve got to be kidding. Well, she USED to think that, but no longer does. She finally let me make some for her and now – well – it’s her favorite burger topping! So I thought I’d share the recipe with you – it’s definitely worth the trouble to make (which really isn’t much trouble!) and it’s EVER SO YUMMY. Stir occasionally, until the fat is rendered and the bacon is browned, but not burned or overly crispy. Scoop out the first batch of cooked bacon with a slotted spoon, and drain it on a paper towel-lined plate. Cook the remaining batch. This should take about 25 to 30 minutes total for both batches. 2 Cook the onions and garlic: Drain all but 2 tablespoons of fat from the pan. You can eyeball it. Add all the bacon back to the skillet. Add the onion and garlic to the skillet and cook until the onions are translucent, about 6 minutes. Reduce the heat to medium low, and simmer uncovered, stirring occasionally, until the liquid turns syrupy and almost completely evaporates—this should take about 30 minutes. 4 Store and reheat if needed: Use immediately, or spoon it into an airtight jar and refrigerate for up to four weeks. Serve warm. To reheat, zap it in the microwave for about 45 seconds or warm it in a small saucepan on the stove over medium heat, stirring occasionally until heated through, about 10 minutes. Yep – that’s what The Royal Mom said when she tried some……….good on crackers, ESPECIALLY good on burgers, good with all sorts of things and it might sound like a pain in the neck to make but really – isn’t just about EVERYTHING a pain in the neck unless you are excited to make it? If you love bacon – GO FOR IT. Yep – and plenty of it! Not in our castle……leftover bacon simply does not exist! Give this a try – I promise you will love it. If my ROYAL MUM can be happy with it, well – anyone can! Happy Caturday – may your own castle have the aroma of bacon cooking!! Greetings Loyal Subjects of Baconia……’tis I – your King – in the kitchen for another little bacon treat!! This is one EASY PEASY recipe and I hope you’ll try it. I say in the instructions that it makes enough for company but the truth is, if you’re hungry and watching a movie or something on the tube, you can easily gobble these down without a second thought with your significant other (yes Mom – this means you and DAD!). Since it’s football season, it could be a nice addition to your array of appetizers for your company that’s yelling and screaming right along with you (while the household pets hide in another room of course). My Mom is the football fan in my house – she’s QUIETER now than she used to be (Angel Sammy told me she used to get QUITE ANIMATED watching football). Nowadays she just sits in her recliner and mutters the occasional “NO NO” word if her Washington Redskins are in trouble (like last week right Mom??). Anyway, this appetizer is worth giving a try – because it has BACON IN IT OF COURSE! Separate each can of dough into 8 triangles; cut each triangle lengthwise in half. Spread each dough triangle with 1 generous tsp. cream cheese mixture; roll up, starting at short side of triangle. Place, point-sides down, on baking sheet. OK now you must admit, this sounds yummy – know why? Because they ARE yummy. And really easy. And this recipe makes enough for company. Super yum for watching TV – movie night? Sports program? Whatever!!! Yep – I’m heading down this road…..won’t be long before I’m telling my Mom this!!! Signing off from Castle Baconia – Have a great Saturday ! Recite a poem…karaoke, just a picture with a box, etc…anything goes no rules except RED! Madi’s favorite color was RED. The Hop is being hosted by Raz of Friends Furever. 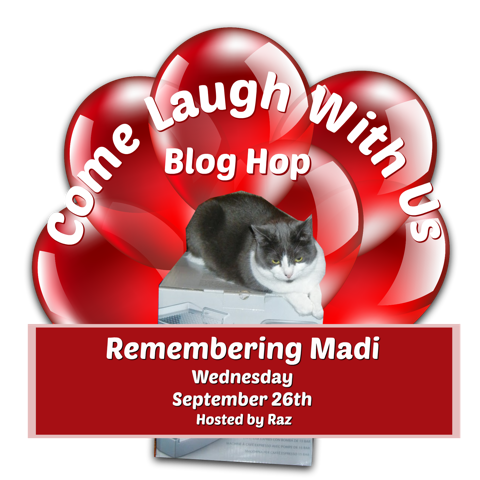 There will be a link set up at Living Laughing and Barking in our Backyard so Madi’s Mom and Dad can see all your wonderful posts. Baking with Bacon in Castle Baconia! Welcome to the kitchen of Castle Baconia – I am your King but on Saturday I’m also your chef! That’s right – I have taken on the responsibility of loading you all up with recipes that involve BACON and today is no exception…….this one is a MAJOR winner at our house. Mom likes to have uses for her leftover smashed (oops I mean mashed) potatoes so you CAN use those but you can also just join up a fresh batch. My parents here in the castle are BIG on bleu cheese and some people aren’t so you can substitute if you want. But trust me – this is another GOOD TASTING SIDE DISH!! This HAS to be good!!!!!!! You know most recipes are truly just GUIDES – people who cook adjust/substitute as they want to so of course that applies to any and all of the recipes I give to you. That goes for bacon too – turkey bacon can be substituted! But the fact of the matter is BACON does make everything better!!!! Now are you going to add these items to your grocery list? I bet you do………………would I steer you wrong? No I would NOT. I am your King and you can trust me…………make sure and tune in next Saturday for another GEM from the Castle Baconia kitchens………..
Good Morning! It’s ME – your King – here to pass on a great summer time recipe for something REFRESHING with bacon! I don’t know about you, but here in the Castle, my loyal subjects and I all appreciate having a LIGHT lunch or supper when it’s hotter than hot outside. You feel better when you eat more “light” in the hot weather don’t you think? Well, salads come to the rescue around here. I asked our Royal Chef to come up with some baconized salad recipes and he just stared at me so I’m giving you a recipe I like and I hope you’ll like it to!! My King, I was surprised a kingly cat such as Your Highness would eat something as simple as a SALAD!! Well surprise – I love bacon in a salad! Try this! In a large bowl, stir together the Ranch dressing, onion, and tomatoes. Mix in the cooled pasta. The pasta will absorb some of the dressing, so don’t worry if it seems like too much. Refrigerate for several hours or overnight. Crumble bacon over the top just before serving. Totally easy and totally delicious at the same time. This is our GO TO salad in summer next of course to shrimp salad which will always be my favorite summer salad. Don’t you just love an easy meal? I know when the weather is nice nobody wants to be stuck in the kitchen making some “heat up the kitchen” meal. This salad is refreshing as it can be. I just HAD to leave you with a smile or two hence the “baconian jokes”! Happy Saturday to all my loyal subjects! Indeed it does……………and I’m just the guy to provide it to my loyal subjects! What kind of King would I be if I didn’t? I have a couple of NEW things to show you but then anything bacon NEVER gets “old” right? I told our castle cook to get plenty of bacon ready to fry up for us! Which he did! Then he told me about a few new recipes he was trying out….. I told him to add all of the above to our menus in the future…………..even those dates – I never had a date but I’m game for anything that’s been baconized! How about you?? Yep – that’s me for sure………..sorry about that! Ain’t THAT the truth!!!!!!! This could be two cats too!!!! So if you find something FUN that you’d like me to use for our Bacon Saturdays in the future just send it my way……………I’m always looking for additions to our “KITCHEN” and our Chef here at the castle is trying to keep his King and all of his fellow Baconians HAPPY after all! OR ELSE……….. Enjoy your Saturday AND your Bacon! Greetings Residents of the Kingdom of Baconia! It’s Saturday and you know what THAT means…………….we will honor the nectar of the gods – well, not nectar because that’s a drink – it’s more a FOOD of the gods…..yeah – that’s what it is a FOOD! Piles of it………….everywhere – as far as the eye can see………….and that’s what we celebrate here on Saturdays so are you ready? Are you? I thought we’d start with dessert! Yep – I love dessert so this is what I’ll look like in a few months……. Oh why not! We deserve something other than orange juice for breakfast once in a while right? Then for our main course – MORE DESSERTS!!!!!!!!!! Don’t be afraid – I haven’t gone off my nut – I’m just thinking once in a great while we should go nuts here in Baconia and fill up on SWEETS! Spoil ourselves! After all, I AM the KING………..and I get to do what I wanna do! Eat up! Not in MY Kingdom!!!!!! Enjoy your bacon feast and I’ll see you next Saturday my friends! Remember, Angel Sammy is watching you – he would want you to fight for your right to BACON! We are gathered together this hot and muggy morning here in Baconia to celebrate as usual our favorite thing – BACON. I have scoured my Kingdom to find a few NEW bacon treats and did manage to find two or three that I had not shared with my loyal subjects before today. Here they are – may they WHET your appetite for some bacon at YOUR house! I’m not entirely sure our Royal Bacon Taste Tester has provided photos of things we have not had before either – you know after a while all the bacon goodies begin to look the same! But one thing is for sure – they ALL HAVE BACON and they all look MIGHTY TASTY! Yep – nothing like a bit of a giggle to start off a Saturday full of bacon right? Is there anyone in the world left who doesn’t have an official BACON BADGE from Angel Sammy? You know he started this Saturday bacon-o-rama years ago and for all I know, he’s probably the KING OF BACON by now at the Rainbow Bridge. Help yourself to the badge if you’d like to declare your loyalty!! Now it’s time to begin our day – which I will do in my usual Kingly way – with a NAP!!!!! That’s right – nothing is better and we’re gonna enjoy it today for Bacon Caturday right gang? So are mine! BIG TIME! What shall we have for breakfast this morning????????? Yeah I think we’re on the right track…………by the time we finish with this meal we will have our FILL for the week right everyone? This is my buddy and pal Mauricio from Kitties Blue modeling the latest in cupcake hat wear……doesn’t he look fabulous? You see Mau is the official Cat Scouts baker. He has a Bake Shop at Scouts and when we need a special cake or cookies or better yet – CUPCAKES – he’s the guy to see. I think he makes a most handsome cupcake don’t you? Thanks for sending me the MEME guys – I love it. I know this has ZIP to do with bacon, but it’s one of my Mom’s favorite things to giggle over so I’m indulging her today – after all, she’s MAKIN’ BACON for me this morning! OH IT IS SO GOOD TO BE KING!!!!!!!!!!!!! !